Grand Prix have recently released their fourth album, more or a less a straight out rocker, called Speed of Sound. Much has been made by some critics of Grand Prix's fascination with cars and racing, but actually this album is probably the one with the least focus on those subjects, unlike Racing Lines from 2002 or Way of the Racer, released in 2004. However, that fascination has always been a bit tongue in cheek - in an interview a few yeas back Grand Prix main man Andrew Mckenzie was asked if he was a Holden or Ford man. He responded that he was more like a Playstation man. 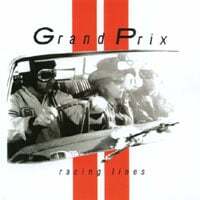 There has been an evolution across Grand Prix's four albums that is much more significant than the gradual shift from an automotive theme and that is the change in their sound. Debut Racing Lines was when the car fixation was strongest. Back then the band was a three piece country outfit with two guitars and featuring male and female vocals. All three members adopted the pseudonym Firestone and songs had titles like 'Wheel's On Fire', 'Donuts in the Sand' and '200 Miles An Hour'. By 2004's Way of the Racer there had been a dramatic line-up change with only Andrew Mckenzie (Dunlop Firestone) remaining from the original group. He now fronted a four piece that included bass (Michael Banks), drums (Davey Geard) and trumpet (Viv Treweek). The fascination with car racing remained but the trumpet and twang give the album a tex-mex feel that will be familiar to fans of American band Calexico. In 2007 Grand Prix signed with Arch Hill records and released their third album Terraplane Twilight. The core four piece band had gone through further line-up changes with a new bass player (Nathan Hickey) and the loss of the trumpeter replaced by keyboardist and guitarist (Adam Ladley). A reverb soaked surf guitar sound features throughout the album supplemented by an array of musical flourishes such as organ, farfisa, glockenspiel and violin. At the time of its release I was a little disappointed with the move away from the sound of Way of the Racer, but returning to the album now it stands up, the surf guitar giving it cohesion with its more instrumentally diverse nature adding interest. This year, Grand Prix released their fourth album, and second for Arch Hill, Speed of Sound. The line-up has remained the same but the sound has moved even further from the band's country origins. The surf guitar is gone, replaced by a heavier, rockier sound, that many reviewers have said makes for great driving music. Those car metaphors may yet prove to be millstone for Grand Prix but I can't resist one more. Grand Prix's musical journey isn't so much a flat-out run down the straight but more like a road trip along a winding highway. I've posted Grand Prix videos on the video page and you can hear a live performance recorded by National Radio (stream).